Learning a musical instrument is a great experience for children of all ages. The violin can be a noisy instrument and may be difficult for younger children to learn. For toddlers and preschoolers, a toy violin is a great alternative. Here, you will find a range of different styles of the violin to suit boys and girls of all ages and abilities. If your child really enjoys their new toy, it might be time to start looking for a real violin for beginners. It’s best that your child gets started with a beginner violin as it would help them get to know the instrument better before they decide if they want to keep pursuing it. There are a few things worth bearing in mind when shopping for a violin for your child. Check the size of the toy to make sure your child will be able to hold it properly. Review the functions of the violin to ensure it is what you are looking for. Some can be used to play songs at the touch of a button, whereas others are more intended to be used just like the real thing to play simple tunes. Also, think about their age and ability. Most children’s violins are aimed at younger children and toddlers, so older kids will probably get bored quickly. However, we have included something for older children – the building toy which is first on the list below. 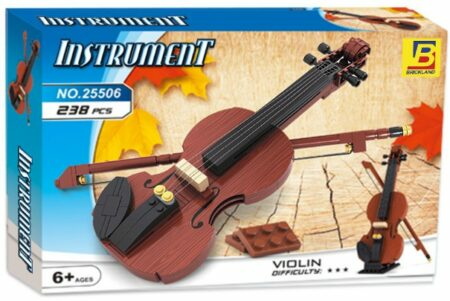 This is one of the best toy violin for older children. The 200+ piece set is ideal for those aged 6 years old and above. The bricks are compatible with LEGO and other major brick building toy brands. There are 50 other products in the range. If your child enjoys building this model, why not see if there’s another object they may enjoy? Building the violin model is a great activity for parents and children to enjoy together. It will look great displayed in a young music lovers room! The model is highly detailed, and it is made from great quality materials which are sure to last. Overall, it’s a great alternative for those looking for something a bit different from the usual LEGO kits. 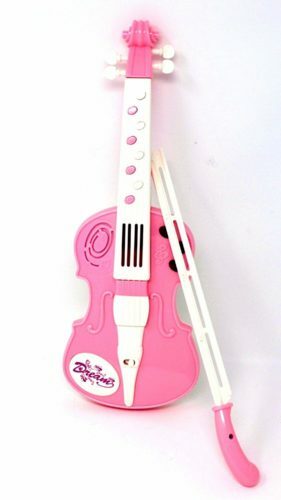 This pink violin is great for little girls who love to make music. As well as playing sounds, it also lights up and features 3 different activity modes to ensure kids don’t get bored. Toddlers can use the violin to create their own songs and rhythms just by pressing the buttons. The children’s violin toy weighs less than 1 pound, making it perfect for younger kids. It takes 2 AA batteries, so make sure you have some ready so your child can start to play straight away. This toy is great for helping children learn about music from an early age. It is useful for developing your child’s sense of rhythm, in a fun and interactive way. This musical violin toy is great for parents who wish to get their children interested in classical music. It plays 7 classic pieces, from Bach and Mozart, as well as others. Children might also be inspired to create their own, original pieces. This can easily be done by pressing the buttons – it’s simple enough for even young toddlers to master. The violin also has 3 different activity modes, to keep older children entertained. It’s perfect for young children who might be interested in learning to play the violin properly. It can be held just like a real violin, and it also responds when the bow is used correctly. Therefore, it’s great for children who want to copy siblings or parents who play the violin, before committing to buying them a real one. 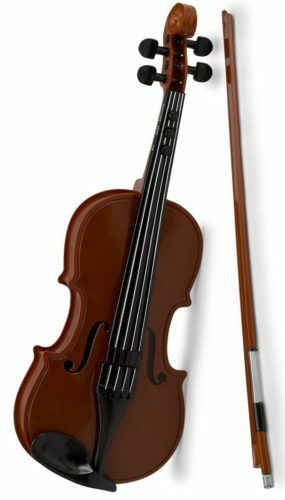 This child sized violin is great for children who want to learn to play. It is ideal as a starter violin, rather than a toy for toddlers or very young children. The violin is made of plastic, rather than wood, which makes it lightweight and easier for children to hold. The children’s violin features 4 steel strings, which give a realistic violin sound. The violin comes complete with a bow, to help children practice holding and using it correctly. The strings can’t be tuned, so it’s no substitute for a real instrument, but it is a great starting place for young kids who might want to learn to play when they’re a little older. This toy fiddle comes in a choice of either blue or pink, making it perfect for both boys and girls. It is easy to play – simply run the bow across the pad in the middle and the sounds will play. It is great for children to practice using the bow, in case they will learn to play a real violin as they get a bit older. The kid’s violin is great for even the youngest musician. It is strong and durable, so won’t get damaged easily even with young toddlers who tend not to be the most careful with their toys! The violin can be used to play either built-in tunes or children can use the buttons to create their very own musical masterpiece! Overall, this is a great value toy for toddlers and preschoolers who love music. This musical toy looks like a real violin but it is much easier for kids to play. Simply press a few buttons and the violin will play one of 7 pre-recorded songs for everyone to enjoy. The toy is made from strong, high-quality plastic meaning it is much less fragile than a real violin. It even comes with a guarantee, which means you can return the product for any reason if you don’t like it. This is great for children who can be a bit fussy about what they will play with! The violin is great for children to learn how to hold it properly from a young age. By using the bow across an interactive button which rocks back and forth, the next note of the song will be played. Young children will love feeling as if they are really playing a tune with their new instrument! This stylish toy looks just like a real electric violin, although slightly smaller for young children to be able to hold it easily. It has both automatic and manual modes, meaning it can be used to play well-known classical music or your child can create their own songs. 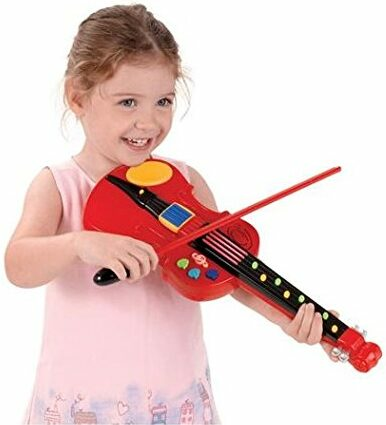 The toddler violin is perfect for children around 3 years old and above. The violin sounds great and offers plenty of songs so parents won’t get bored of hearing it. It’s great for children who love music and want to be just like their parents or siblings who play the violin. Whilst it doesn’t offer the same sounds and effects as a real violin, it is a great starting point for young children. The Fun Fiddle is an excellent choice for children of all ages. It can be used as a tool to help young kids learn the basics of playing the violin, before committing to buying a more expensive instrument. It’s sure to provide hours of fun for young musicians! The plastic pink violin with lights and sounds is a great choice at a lower price. It is ideal for toddlers, who will love watching the lights as they play. The toy is great for helping young kids learn about music, as it has 3 different activity modes to suit all skill levels.